Cognac evokes images of men sitting around in leather armchairs in front of an open fire, hands wrapped around a short glass on a cold night. In this scene, there’s always the possibility of a cigar or even a pipe being smoked. Travel is always full of such great learning experiences, and it was at the House of Rémy Martin, one of the leading makers of cognac in France, where I learned to appreciate the finer points of cognac through one of their many cognac tours. As we commenced our Cocktail Creation tour with Margot, the Chargée de Visites et Boutique at Rémy Martin, it occurred to me how little I knew about cognac. What was it? How was it made? Why don’t people I know drink it? Luckily, our visit here would cover all the important aspects of this interesting brew. Did you know that all cognacs are brandy, but not all brandies are cognac? Similar to the history that surrounds the word Champagne, Parmigiano Reggiano cheese, Parma ham or Modena vinegar, the word cognac is strictly applied. Given only to those brandies made within the confines of the Cognac region and produced under strict protocols. Rémy Martin cognac is double distilled using age-old traditional methods dating back to their inception in 1724, With the production finishing times also directed by the appellation, the grapes are harvested, pressed and yeast added. No sugar is allowed to be added at this stage. Production commences around November and must be completed by 31 March each year. Small copper pot stills are still used for distilling the wine. The lees (dead yeast) are added to the wine which adds to the aromatic nature and texture of it. This passes through the boiler and steam escapes through the chapiteau. Next, it passes through a condenser where it sits for around 11 hours. This forms the brouillis, a cloudy liquid of around 30% alcohol. It takes nine litres of wine to make three litres of brouillis. A second distillation of the brouillis is undertaken. Both the “heads” (too strong) and “tails” (too weak) of the second distillation are discarded and mixed with another brouillis or next batch of wine. This leaves the “heart” for use in the production of cognac. After 48 hours, the “waters of life” or Eau-de-vies, at 70% alcohol is produced. Twelve kilograms of grapes makes 1 litre of eau-de-vie. Six to seven thousand new barrels are purchased each year for the first ageing of the eau-de-vie. In order to finalise the cognac process, the eau-de-vie must be aged in oak barrels from anywhere between one and three years. The oak barrels add the first level of colour to the liquid, and impart their own flavours over time. All of the Rémy Martin cognacs are blends of eau-de-vie, sometimes taking hundreds of different ones to make one bottle of cognac. Founded in 1724, the House of Rémy Martin has a rich history in the city of Cognac that lent its name to this famous alcohol. Rémy Martin, the company’s first president, clearly the innovator of the family, commenced production, kicking off a journey I am quite sure he would have never dreamed possible. He refined his craft over his lifetime, only stopping just before he died at age 75, something quite remarkable for the 1700’s. From son, to grandson, the presidency changed hands but was always kept within the family. In 1870, the fourth Rémy Martin was a leader ahead of his time. His focus was on exporting cognac, especially to China. He also developed the Rémy Martin logo, a centaur, so that countries all over the world could instantly recognise the brand. In 1948, the house commenced exclusive use of grapes from the Grande and Petite Champagne regions, and later this blend called Fine Champagne would be recognised for its exceptional quality. In these locations, the soil is said to be unique and ideal for the growing of the grapes that make the all-important eau-de-vie. These areas are known as prestige locations due to the presence of soft, chalky soil. All cognac was hand bottled here until the 1960’s and in 1980’s the production facility was relocated for security reasons. All cognac starts off at 70% alcohol and reduced 40% and as such is highly flammable. They owned 280 hectares of grape growing land, however, this represents only 4% of what is needed to make their cognac. In 1965, a co-operative called the Alliance Fine Champagne was created, bringing together growers and the producer. Under this agreement, the growers must adhere to very strict rules and processes in order for their grapes to be able to be used by Rémy Martin. Strict appellation guidelines on Rémy Martin dictates the type and origin of the grapes, along with harvesting times, processing times, and even how they should be grown. For example, grapes for their cognac are not allowed to be irrigated. This is why the chalky soil becomes so important, and why the Petite and Grande Champagne areas were favoured for growing their grapes. The chalk absorbs rain and expands, acting like a sponge for the vines above. Covers are not allowed to be used, putting the grapes at the mercy of Mother Nature during times of severe cold or hailstorms. In April 2017, a severe frost impacted all crops in the Cognac region and have significantly impacted the annual supply. 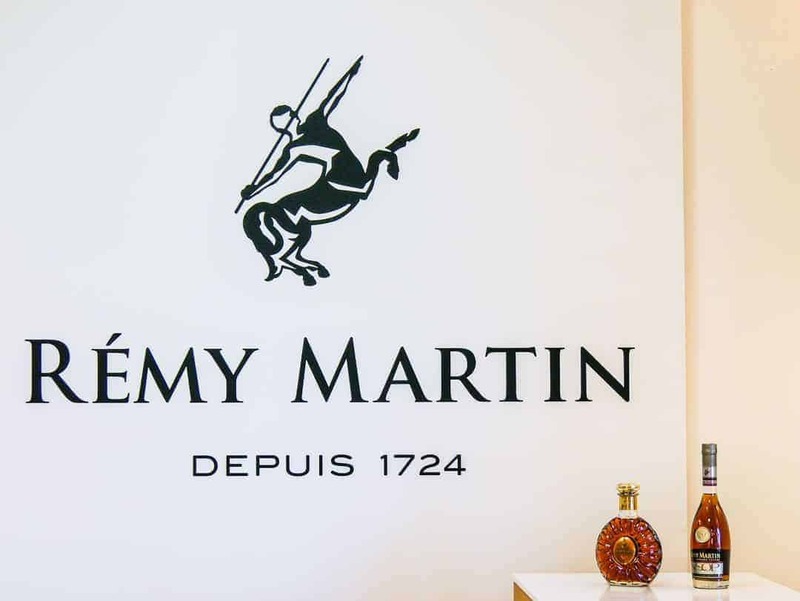 Today, Rémy Martin is one of the leading four cognac producers in France and in 1991 also acquired the Cointreau brand, becoming Rémy Cointreau. Still family owned by the Heriard Dubreuil family, this French business has built an enduring legacy of goodwill amongst family members, staff and the growers that work for them. The winegrowers have a reason to care about their product. They are treated like shareholders and share in the benefits of producing excellent grapes. The better the grapes, the greater the potential for great eau-de-vie, and so the growers are incentivised through bonuses of up to 10%. Showing the true spirit of a two-way partnership, the cellar master and his team of four are constantly on hand to the farmers to provide advice and support. As we approached the cellars, Margot advised that “due to the high alcohol content in here, we can’t allow photography as it is highly explosive”. Now that’s a warning I’ve never had before! The outside of the beautiful stone building was black, covered with a fungus that lives on the alcoholic vapours. Inside, the fungus continues to grow around the floors of oak barrels, all filled with various types and ages of eau-de-vies and cognacs. Secret numbers written on the outside of the barrels identify the vine, the alcohol percentage and the number of hectolitres in a row of the one blend. Here, at Rémy Martin, 140,000 barrels sit on-site. Despite being in barrels and the ageing room under relevant conditions, 3% of the barrel contents evaporate each year. This equates to approximately 6,000 barrels. Knowing how extensive (and expensive) the process is, and the cost of bottle sales foregone, I nearly fell over! 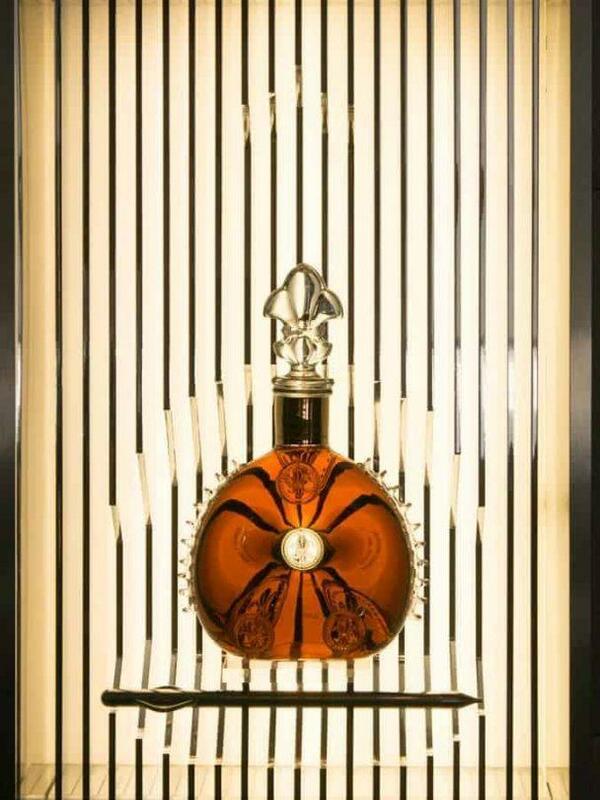 The jewel of the house, Louis XIII cognac is stored in different barrels and isolated from the mainstream cognacs. The barrels, some a hundred years old, are not stacked, given the fragility of the wood. Made using the same recipe as when it was created in 1874, it is the only non Fine Champagne cognac made by Rémy Martin comprised of 100% Grande Champagne. To give a sense of the special qualities and reputation this complex cognac has, around 1,200 eau-de-vies are needed to make one bottle. In comparison, a bottle of VSOP may require one hundred. 40 years old is the age of the youngest eau-de-vie that is used to make Louise XIII and the oldest is 100 years. With all of these incredibly involved processes, regulations, and knowledge of blends required, it is no wonder that the role of Cellar Master is of critical importance to the success of this business. The role of cellar master is no ordinary role for many reasons. In essence, the cellar master is the lifeblood of the Rémy Martin legacy, keeping old traditions alive and ensuring that the quality of the cognac that is produced is of impeccable, never-failing quality. Being a cellar master takes time to learn and hone the techniques. Nothing is written down. How can it be, when the main tool of trade is a sense of smell? Cellar masters test the various blends only by smell, never taste. I asked Margot, in all seriousness, whether the cellar masters insured their noses. Whilst she wasn’t entirely sure about this aspect, she did state that “two cellar masters never travel on the same plane together”. Like corporate boards and key executives, part of their risk assessments means they can never afford to be without a cellar master. This age-old process takes years, usually in the order of 15 years, to be able to learn all there is about the role. It’s the reason why succession planning here at Rémy Martin is taken very seriously indeed. I was looking forward to tasting the cognac. I had been on a barge cruise in the south of France previous to this visit and despite it being an option in the bar, I had saved myself for this moment. We learned that you should always eat when drinking cognac. Apples and blueberries go well with the VSOP we were trying, but we are satisfied with our tasty morsels: a squid ink biscuit, smoked salmon, cream cheese mousse with wasabi and a biscuit with blue cheese cream and pear and nut crumble. These canapes are carefully matched to our cognac to heighten the experience. Foie Gras and chocolate are the decadent partners to XO cognac. Mind you, the French don’t seem to need a reason to eat foie gras at any time! Tasting and drinking cognac requires a bit of process, which isn’t surprising given the careful methodologies in place to produce it. However, as we learned more about this, Margot also reminded us of their philosophy, explaining “there are no rules for drinking cognac, you drink it how you like”. We cupped our hands around the glass, warming it up a little. As I took the lid off our tasting glass, the smell was one of pure alcohol and it nearly took my breath away. Like a true connoisseur, Margot sniffs and immediately talks to us of the notes she can pick up. She’s a seasoned professional and I have no doubts about her abilities. On the other hand, this novice could only feel my nostrils burning. We moved the glass around a little, swirling the cognac up the sides of the glass until “legs” could be seen. These weren’t the legs I was used to seeing in wine. These legs were tall and incredibly sticky, hanging onto every bit of glass as it slowly made its way back down, such is the high alcohol content in this honey-like liquid. We smelled again, this time the strong smell had dissipated slightly. Like wine, smelling again after swirling usually has a positive impact and some notes become more apparent. I put the glass up to my lips and took my first sip, letting it sit in my mouth for a while as instructed by Margot. This allows your palate to adjust and try to understand all the flavours of the cognac. A small sip is all I need at first, it’s enough to feel the burn as it runs down my throat. I look across at my husband who I can tell is instantly delighted with his fine drop. I’m not used to drinking straight alcohol, so this was always going to be a little foreign to me. The second sip, accompanied by some of the fabulous food, feels better. Drop by drop, I can feel the liquid evening out, mellowing even, and I start to see what the fuss is all about. I can imagine myself getting quite used to this. Rémy Martin has several labels under their brand name, with VSOP perhaps being the most recognised. A black bottle is used specifically for the US market, whilst a clear bottle is for the French. There is also an XO label and one that is made just for duty-free stores. The signature label is Louis XIII. Having now realised that I liked cognac, I was keen to learn how something that I had long thought was consumed “on the rocks” or straight could be turned into a cocktail. The cocktail making classes are overseen by a dedicated mixologist, a swanky new name for someone I would have once called a cocktail barman. The chic surroundings of the bar and tasting room, however, seem to surreptitiously lend itself to such language. The lesson is hands-on with all ingredients and utensils laid out to make it easy. Our cocktail today is a Rémy Grand Tonic, a refreshing drink if ever there was one, and immediately a new favourite. With a blend of VSOP cognac, extra-dry vermouth, tonic, lemon and plenty of ice, it’s a perfect drink for a hot day. Remember the experts told us that we couldn’t drink cognac without food! Even in the cocktail making session, we were treated to some exquisite gourmet canapes. 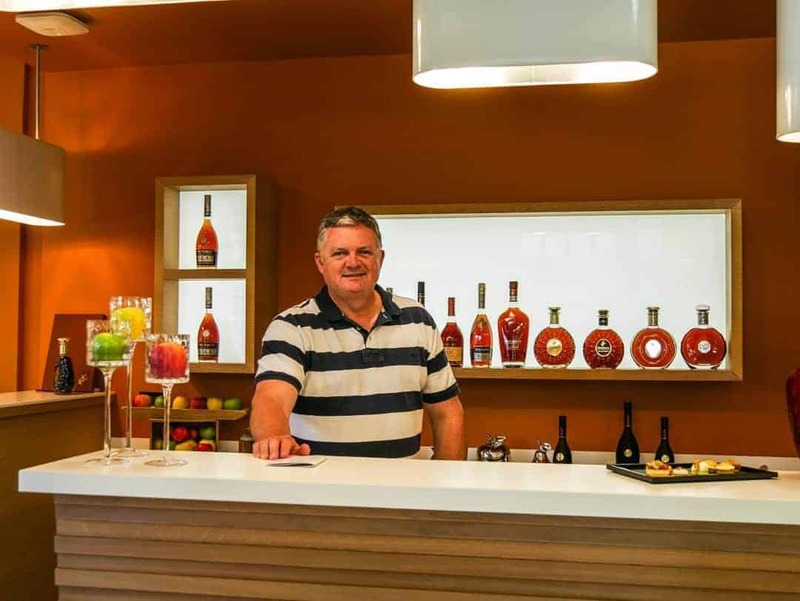 Rémy Martin conducts a plethora of visitation programs across their estates, the Rémy Martin House, the distillery, its restaurant and the family property. At the basic end, the Classic Visit, allows for an introduction to the art of cognac making, visiting the Merpins Estate where the vineyards can be found. Alternatively, visit the historic House of Rémy Martin, once again learning the art of cognac making and touring through the historic house and cellars. both tours include cognac tasting of course. Ranging from €20 – €32 per person, they are a great entry level program, especially if time is limited. Tours run from 1.5-2 hours. There is also a range of private visitation programs that cover everything from the history of the historic house through to gourmet tasting experiences involving perfectly matched foods, or even chocolate. There are also blending courses or a dedicated lunch with the chef at the on-site restaurant. 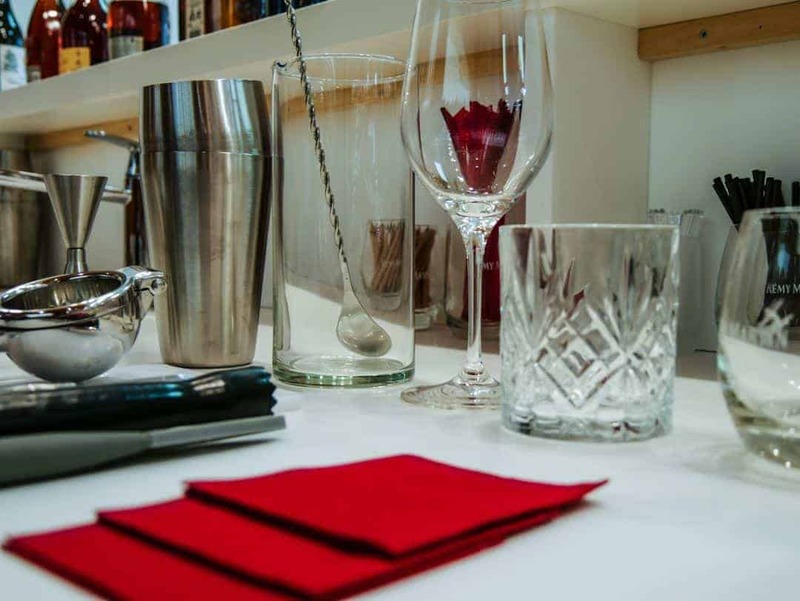 For the ultra-serious cognac aficionado, the ultimate prize is a tasting of Louis XIII. The tastings here are quite the spectacle, but I won’t give away the secret, you’ll have to try that one out for yourself. The visits to the historic house and cellars are always the same, the tastings and other experiences are different. They can adapt to allergies, personal preferences and even do events, suggesting a highly flexible format. Corporate visits and conferences can also be undertaken. With some of the tours being on the more expensive side, especially where Louis XIII is involved, I asked Margot whether they were only for the wealthy. At around €1000 per person for the ultimate Louise XIII experience, you can see why I asked. The answer was categorically “no”. Whilst there are of course those independently wealthy people who wouldn’t blink an eye at paying this amount, there are also those people who have a true passion for it. She advised that many people who do this visit have either had it before or want the whole experience and have usually saved up for it. For more information on the tours, and the latest rates, go to the Rémy Martin website. Is the House of Rémy Martin worth a visit? We also discovered another interesting fact about cognac whilst we were here, and I still find it hard to understand. The French don’t really drink cognac and as such, the majority of it is exported to international markets. In Cognac (perhaps not surprising), various palaces and in Paris, cognac is still enjoyed by the French, however, drinking habits changed after World War Two. At this stage, the French were opened up to the influences of the English and Americans who introduced them to whiskey. Since then, the affection for cognac by the French has never improved. Our time spent at Rémy Martin was wonderful as it provided an insight into making traditional cognac. Even if you don’t drink, or aren’t fond of cognac, the learning experience from a cognac tour alone would make it worthwhile. Exploring centuries-old French houses, getting into cellars where liquid as priceless as gold spends its days, and being able to participate in a wide range of activities is sure to appeal to most people. 80% of all Fine Champagne cognacs are made by Rémy Martin, so they are the leaders in this type of cognac. The Rémy Martin core values of time, people, patience, talent and terroir are clearly articulated and obvious through all of their processes, their relationships with everyone in the chain, and their focus on building a sustainable future through customer service and knowledge of their brand. For the most part, talking to Margot felt as though she was a member of the family who owns the business, such was her enthusiasm, knowledge and care taken of us as her visitors. Perhaps it was also her comment as we sat down to taste, “I drink it all the time. After dinner, for a special event, even when I have a cold I drink cognac” What a perfect statement to sum up this interesting experience. 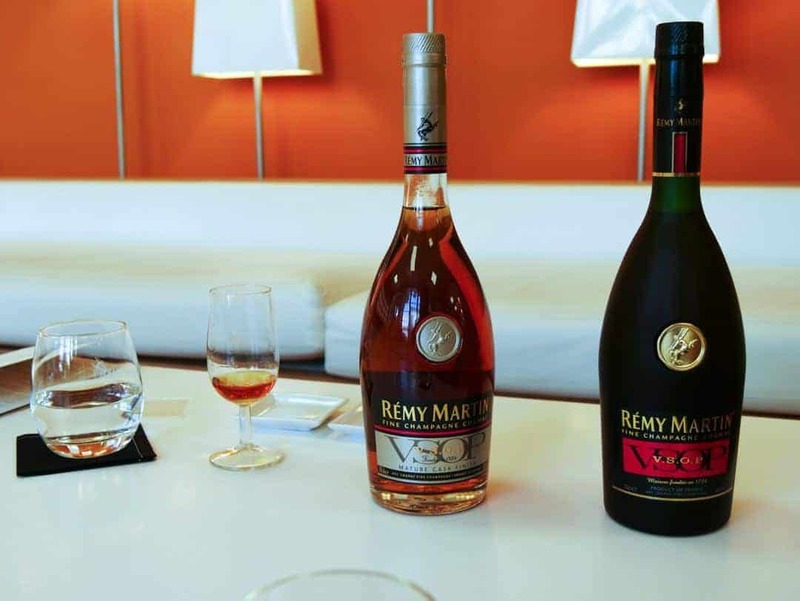 As I left the House of Rémy Martin with a bottle of XO cognac in my hand, I played back my original thoughts of cognac drinkers in my mind and smiled. How wrong I was. Cognac is located in the Charente region of France, 400km south-west of Paris and 97km north of Bordeaux. As Cognac isn’t serviced by an airport, arriving by train or vehicle are the best options. The fast TGV train takes two hours from Paris and the same time on the regional trains from Bordeaux. Driving around Cognac is relatively easy (we did it in a large motorhome) but you cannot drive through the Old Town. There are plenty of parking areas alongside the river. Whilst lending its name to this famous beverage, the city of Cognac is a beautiful city to visit, so be sure to allow yourself time to do both a tour and spend time here as well. Maison Rémy Martin is located at 20 Rue de la Société Vinicole in Cognac. There is a small amount of off-street parking on-site and street parking around the immediate vicinity. Tip: there is a boutique and gift shop on-site so be sure to leave some time to browse around once your tour is over. Whilst we were invited by Rémy Martin to participate in the Cocktail Creations experience, all editorial content is completely independent and all thoughts and opinions are our own. I never realised Cognac was such a strict term. It’s impressive that the methods still used today date back to 1724. And the food you had on the tour looks divine. Those little tapas treats are making my mouth water. so much involved in food in France is strictly controlled! Kerri this is so fascinating. I too had no idea what cognac even was. Mystery to me before reading this post. I do however have that same image seared into my mind; men of means sitting around a dark, stately setting, enjoying cognac in their dress wear, smoking cigars, looking out of the window stoically. Definitely movie-worthy fare there. How interesting! Who would have thought there is so much to learn about cognac! Thanks for clearing up what it is to beginnwith! The tasting experience sounds like something for professionals! Definitely doesn’t compare to my wine tastings Ive had haha! Interesting & detailed information, good research. Nice Photos, specially the ‘distilling equipment’ photo is beautiful. My first thought was how beautiful that distillery equipment is. Then I almost recoiled back with you when the lid came off the tasting glass; I can imagine that was incredibly powerful. I don’t think I’ve had any form of brandy in years other than in a cocktail; a Brandy Alexander on the QM2 comes to mind. But this has certainly reminded me to try one again. Charente’s a beautiful place to visit too, so it sounds like a great trip. Yes the equipment is wonderful and so much of it is original as well. hope you get a chance to enjoy a tipple soon. I had no idea that Cognac was made from grapes! How did I miss this? I’m not much of a cognac drinker, but I would be up for a tour learning about the liquor and tasting foods with it. Sounds like you had a wonderful day, and I learned so much about the process from reading your post. Neither did I Lara until I got here. I actually don’t know what I thought it was made from but grapes never entered my mind! I’m not much of an alcohol person, but I do love trying new things. I love the photo of the tasting room…gorgeous. Also, I would love to eat any and all of the tasting food pairings. Yum! I think there’s enough here in terms of a variety of tours that you don’t have to worry so much about drinking the alcohol. In all honesty we didn’t drink that much. I remember visiting Cognac many years ago and we learned a little more about the process of making brandy and the history of Cognac in particular, but I’ve not been to the famous House of Remy Martin. I guess now the production has been moved, the space must be perfect for an educational visitor centre. I think the tasting room would be my favourite! I can’t believe the warning about photography! That’s insane! Was she serious or just trying to scare people off from taking photos? A very extensive lesson on cognac here. I don’t think I could ever simply pick up a glass of it now without trying to understand a little more of it. I’d love to do this tour, even without drinking any of it -it sounds fascinating. Yes, I did know that all cognacs are brandy, but not all brandies are cognac. I am not a great Cognac fan as I find it too harsh for the most part. I prefer Argmanac which I think is a bit softer. I like the idea of using it in a cocktail. Maybe I will give it another try with foie gras and chocolate!. Chocolate makes everything better! !